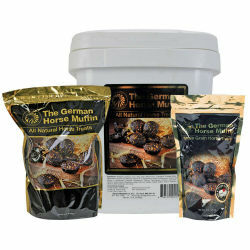 Decadent and addictive, German Horse Muffins from Equus Magnificus are clamored for by horses everywhere. This deliciously addictive indulgence for your horse is made from fresh, all-natural grains and rich molasses combined to perfection. A sweet and chewy taste sensation with no preservatives, artificial flavors or colors. Horses go CRAZY over these!!! Each muffin is a decadent blend of sweet feed and molasses plus corn, oats, bran, wheat flour, cornstarch, soybean meal, dehydrated alfalfa meal, vitamins and more. Options: 1 lb. 6 lb.